Over the next couple of weeks, “Team to Beat” will be talking just a little bit of hockey. With posts on the Winter Classic coming up soon from writer Dan MacNeal and newly added contributor Alicia Sprenkle, there obvious buzz around the 2012 Winter Classic is going to be made apparent this year. As most of you know already, the Philadelphia Flyers will be hosting the New York Rangers in the 5th installment of the Bridgestone tire sponsored event made popular by the National Hockey League. The game, which is unique for being held outdoors in either a football or baseball stadium, will be coming to Citizens Bank Park on January 2, 2012. That’s right, the home of your 2008 World Champion, two-time NL Champion and five-time NL East champion Phillies will be the hosting spot to one of the biggest single-game events of the year. Read after the jump to check out some of the things that were announced in today’s official announcement. As those who like to read Crossing Broad, he has gotten some tips from readers with pictures of the set up. CB reader Chris Waddell posted this picture of the rink set up with center ice hovering right over second base. Also, the jerseys for either team have NOT been revealed. I can honestly say that I am disappointed to see that the rumored Flyers jerseys were neither confirmed or not confirmed. At the announcement, Marian Gaborik, newly acquired Brad Richards and newly named captain Ryan Callahan represented the Rangers. Newly named Flyers captain Chris Pronger, Matt Carle, Scott Hartnell and James van Reimsdyk represented the Flyers. -There will be another “24/7” series on HBO for both teams. Last year’s was an incredible success. It will debut on December 14 at 10pm ET. -NBC will host the game in America. CBC in Canada. Game time will be 1 PM on January 2, 2012. -Gary Bettman was not booed at the event… but booed several times on Twitter. -The Alumni game will be on December 31 at 1 PM. The Adirondack Phantoms will play the Hershey Bears on January 6 in an AHL match up. 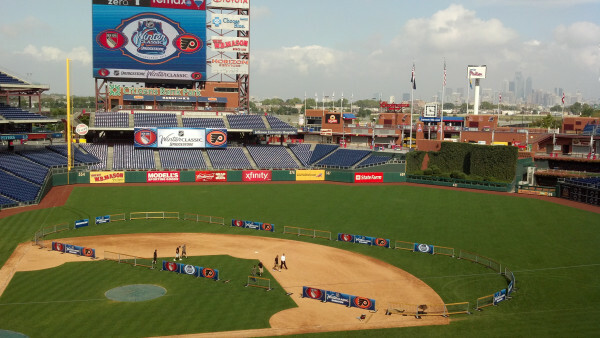 Penn State is also reportedly supposed to play a game on the ice at CBP. -There was no official announcement on jerseys just yet. Both the Rangers (away) and Flyers (home) were wearing their normal jerseys with no Winter Classic patch on them. -NHL said they won’t have ticket information available for several weeks.